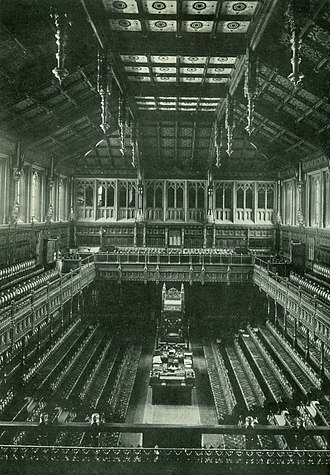 Ministers of the Crown, and especially Cabinet ministers, are selected primarily from the elected members of House of Commons, and from the House of Lords, by the Prime Minister. Cabinet ministers are usually heads of government departments, mostly with the office of "Secretary of State for [function; e.g., Defence]". 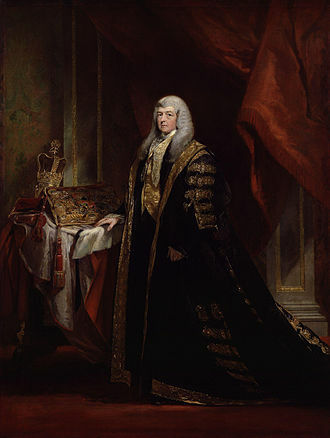 However some cabinet ministers can be ministers without portfolio, either directly as such or (more commonly) by holding sinecure posts such as Lord Privy Seal, or otherwise empty titles such as First Secretary of State. Certain other cabinet ministers are in a somewhat hybrid position, where they have a portfolio, but do not head a government department; the Lord President of the Council being such an example, where that office has accreted a collection of responsibilities over time, but which does not have a Lord President's Department attached to it. Whilst generally the most powerful and/or prestigious members of the Cabinet head critical ministries such as the Foreign Office, ministers without portfolio can also be important components, for example Michael Heseltine as Deputy Prime Minister in the Second Major ministry. By far the most powerful Cabinet Minister, the Prime Minister, heads no department, though the Prime Minister's Office co-ordinates their oversight of the whole government. The collective co-ordinating function of the Cabinet is reinforced by the statutory position that all the Secretaries of State jointly hold the same office, and can exercise the same powers.. This does not, however, apply to the non-secretaries of state in the Cabinet such as the Leader of the House of Commons (when such office of Cabinet rank). 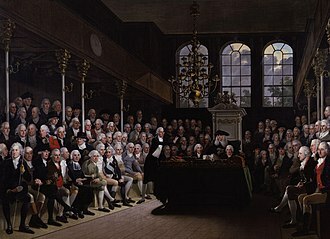 Technically, therefore, the Cabinet is composed of many more people than legal offices, since the Secretary of Stateship is actually in commission, as is the position of Lord High Treasurer, with the Prime Minister and Chancellor being the First and Second Lords of the Treasury respectively. The Cabinet is the ultimate decision-making body of the executive within the Westminster system of government in traditional constitutional theory. This interpretation was originally put across in the work of nineteenth century constitutionalists such as Walter Bagehot, who described the Cabinet as the "efficient secret" of the British political system in his book The English Constitution. The political and decision-making authority of the cabinet has been gradually reduced over the last several decades, with some claiming its role has been usurped by a "prime ministerial" government. In the modern political era, the Prime Minister releases information concerning Cabinet rank; a list detailing the seniority of all Cabinet ministers. 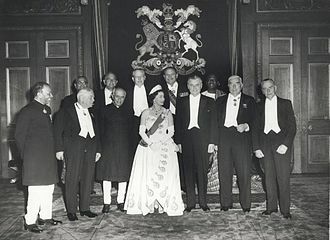 The Cabinet is the executive committee of Her Majesty's Privy Council, a body which has legislative, judicial and executive functions, and whose large membership includes members of the Opposition. Its decisions are generally implemented either under the existing powers of individual government departments, or by Orders in Council. Until at least the 16th century, individual Officers of State had separate property, powers and responsibilities granted with their separate offices by Royal Command, and the Crown and the Privy Council constituted the only co-ordinating authorities. 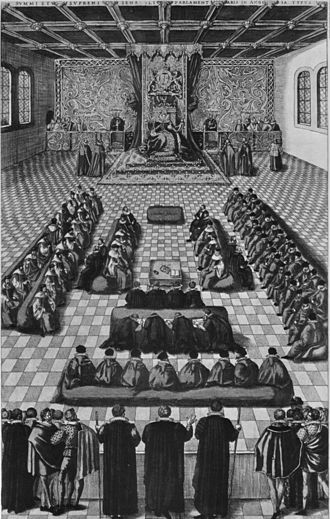 In England, phrases such as "cabinet counsel", meaning advice given in private, in a cabinet in the sense of a small room, to the monarch, occur from the late 16th century, and, given the non-standardised spelling of the day, it is often hard to distinguish whether "council" or "counsel" is meant. The OED credits Francis Bacon in his Essays (1605) with the first use of "Cabinet council", where it is described as a foreign habit, of which he disapproves: "For which inconveniences, the doctrine of Italy, and practice of France, in some kings’ times, hath introduced cabinet counsels; a remedy worse than the disease". Charles I began a formal "Cabinet Council" from his accession in 1625, as his Privy Council, or "private council", and the first recorded use of "cabinet" by itself for such a body comes from 1644, and is again hostile and associates the term with dubious foreign practices. There were ministries in England led by the chief minister, which was a personage leading the English government for the Monarch. Despite primary accountability to the Monarch, these ministries, having a group of ministers running the country, served as a predecessor of the modern perspective of cabinet. 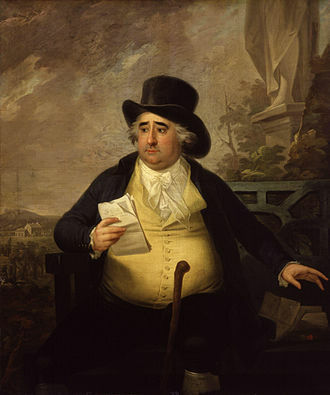 After the ministry of James Stanhope, 1st Earl Stanhope and Charles Spencer, 3rd Earl of Sunderland collapsed Sir Robert Walpole rose to power as First Lord of the Treasury. Since the reign of King George I the Cabinet has been the principal executive group of British government. 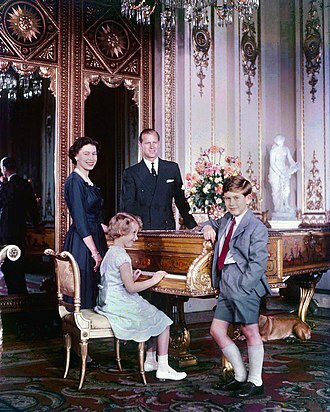 Both he and George II made use of the system, as both were not native English speakers, unfamiliar with British politics, and thus relied heavily on selected groups of advisers. The term "minister" came into being since the royal officers "ministered" to the sovereign. The name and institution have been adopted by most English-speaking countries, and the Council of Ministers or similar bodies of other countries are often informally referred to as cabinets. The modern Cabinet system was set up by Prime Minister David Lloyd George during his premiership, 1916–1922, with a Cabinet Office and Secretariat, committee structures, unpublished minutes, and a clearer relationship with departmental Cabinet ministers. The formal procedures, practice and proceedings of the Cabinet remain largely unpublished. This development grew out of the exigencies of the First World War, where faster and better co-ordinated decisions across Government were seen as a crucial part of the war effort. Decisions on mass conscription, co-ordination worldwide with other governments across international theatres, and armament production tied into a general war strategy that could be developed and overseen from an inner "War Cabinet". The country went through successive crises after the war: the 1926 United Kingdom general strike; the Great Depression of 1929–32; the rise of Bolshevism after 1917 and Fascism after 1922; the Spanish Civil War 1936 onwards; the invasion of Abyssinia 1936; the League of Nations Crisis which followed; and the re-armament and resurgence of Germany from 1933, leading into another World War. All these demanded a highly organised and centralised Government centred on the Cabinet. This centralisation enhanced the power of the Prime Minister, who moved from being the primus inter pares of the Asquith Cabinets of 1906 onwards, to the dominating figures of David Lloyd George, Stanley Baldwin and Winston Churchill. 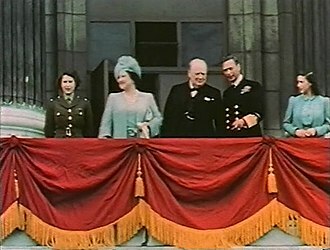 Cabinet ministers, like all ministers, are appointed and may be dismissed by the monarch without notice or reason, on the advice of the Prime Minister. The allocation and transfer of responsibilities between ministers and departments is also generally at the Prime Minister's discretion. The Cabinet has always been led by the Prime Minister, whose originally unpaid office as such was traditionally described as merely primus inter pares (first among equals), but today the Prime Minister is the preeminent head of government, with the effective power to appoint and dismiss Cabinet ministers and to control the Cabinet's agenda. The extent to which the Government is collegial varies with political conditions and individual personalities. Any change to the composition of the Cabinet involving more than one appointment is customarily referred to as a reshuffle; a routine reshuffle normally occurs every summer. The total number of ministers allowed to be paid as "Cabinet ministers" is limited by the Ministerial and Other Salaries Act 1975, but there may be regular attendees at Cabinet who are not paid as Cabinet ministers. The number in addition to the Prime Minister is currently 21, total cabinet composition fluctuating between 21 and 23. The Cabinet Secretary does not have a political appointment such as Secretary of State and is not a member of the Cabinet, but is the professional Head of Her Majesty's Civil Service. (The Cabinet Secretaries of the devolved Scottish Government are Scottish Ministers, unrelated to the U.K. Cabinet). The Cabinet has come to be made up almost entirely of members of the House of Commons. The Leader of the House of Lords is a member of the House of Lords. Otherwise it is rare for a peer to sit in the Cabinet. The Lord Chancellor was formerly the presiding officer of the House of Lords, but since 2007 need not be a member of the Lords, and members of the House of Commons have been appointed. Until the re-appointment to the cabinet of Peter Mandelson on 3 October 2008, the old Leader of the Lords, Valerie Amos, was the last peer to sit in any other Cabinet post, as Secretary of State for International Development from May to October 2003. Before then, the last Secretary of State for a major department drawn from the Lords was David Lord Young of Graffham, serving between 1985 and 1989 as Secretary of State for Employment until 1987 and Secretary of State for Trade and Industry until 1989. The number of junior ministers who are peers has increased since 1997. There are some 100 junior members of the Government who are not members of the Cabinet, including Ministers of State and Parliamentary Under-Secretaries of State; and unpaid Parliamentary Private Secretaries are in practice apprentice ministers on the payroll vote. Some of them may be Privy Counsellors, or may be appointed to the Privy Council as a mark of distinction, without becoming Cabinet ministers. Equally, some junior ministers below Cabinet level may be invited to all Cabinet meetings as a matter of course. 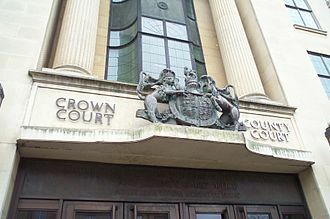 The Attorney General for England and Wales together with the chair of the governing political party, are customarily included, and other members of the Government can be invited at the Prime Minister's discretion, either regularly or ad hoc. Since the end of the twentieth century more non-members of Her Majesty's Government were permitted by the Prime Minister to attend Cabinet meetings on a regular basis, notably Alastair Campbell in his capacity as Director of Communications and Strategy between 1997 and 2003, and Jonathan Powell, the Chief of Staff to the Prime Minister, under Tony Blair, with a distinctly separate role from the Cabinet Secretary/Head of the Civil Service. A photograph is taken of each new Cabinet in the garden or drawing room at 10 Downing Street. The Cabinet meets on a regular basis, usually weekly on a Thursday morning notionally to discuss the most important issues of government policy, and to make decisions. Despite the custom of meeting on a Thursday, after the appointment of Gordon Brown as Prime Minister the meeting day was switched to Tuesday. However, when David Cameron became prime minister, he held his cabinet meetings on Thursdays again. The length of meetings varies according to the style of the Prime Minister and political conditions, but today meetings can be as short as 30 minutes, which suggests announcement or ratification of decisions taken in committee, by informal groups, or in bi-lateral discussions between the Prime Minister and individual colleagues, with discussion in Cabinet itself very limited. The Prime Minister normally has a weekly audience with the Queen thereafter. The Cabinet has numerous sub-committees which focus on particular policy areas, particularly ones which cut across several ministerial responsibilities, and therefore need coordination. These may be permanent committees or set up for a short duration to look at particular issues ("ad hoc committees"). Junior ministers are also often members of these committees, in addition to Secretaries of State. The transaction of government business through meetings of the Cabinet and its many committees is administered by a small secretariat within the Cabinet Office. Consequent Orders in Council are normally made by the Queen-in-Council with a quorum of the Privy Council, which meets monthly or ad hoc. The Institute for Government claims that the reduced number of full Cabinet meetings signify "that the role of Cabinet as a formal decision-making body has been in decline since the war.". This view has been contradicted by Vernon Bogdanor, a British constitutional expert, who claims that "the Cabinet has, in fact, been strengthened by the decline in full meetings, as it allows more matters to be transferred to cabinet committees. Thus, business is done more efficiently." Most Prime Ministers have had a so-called "kitchen cabinet" consisting of their own trusted advisers who may be Cabinet members but are often non-cabinet trusted personal advisers on their own staff. In recent governments, generally from Margaret Thatcher, and especially in that of Tony Blair, it has been reported that many or even all major decisions have been made before cabinet meetings. This suggestion has been made by former ministers including Clare Short and Chris Smith, in the media, and was made clear in the Butler Review, where Blair's style of "sofa government" was censured. Cabinet meetings are usually held in the Cabinet Room of 10 Downing Street, the Prime Minister's official residence. Cabinet meetings have also been held at Chequers, and in one case at the Grand Hotel, Brighton. 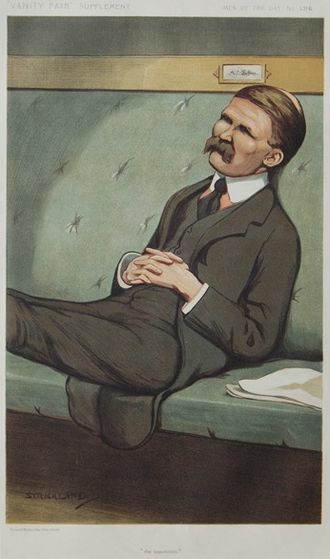 In September 1921, under David Lloyd George, a Cabinet meeting was held at Inverness Town House in the Scottish Highlands to discuss the Irish question. In 2008 Gordon Brown introduced regional cabinet meetings, when the cabinet meets in different locations across the UK a number of times a year. There are two key constitutional conventions regarding the accountability of cabinet ministers to the Parliament of the United Kingdom, cabinet collective responsibility, and individual ministerial responsibility. These are derived from the fact the members of the cabinet are Members of Parliament, and therefore accountable to the House of which they are a member. 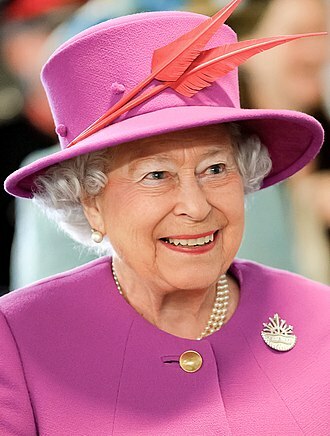 The Queen will only appoint a Prime Minister whose Government can command the support of the House of Commons, which alone can grant supply to a Government by authorising taxes; and the House of Commons expects all ministers to be personally accountable to Parliament. In practice, Cabinet ministers will usually have a junior minister to represent their department in the House of Lords. Cabinet collective responsibility means that members of the cabinet make major decisions collectively, and are therefore collectively responsible for the consequences of these decisions. Therefore, no minister may speak against government decisions, and if a vote of no confidence is passed in Parliament, every minister and government official drawn from Parliament is expected to resign from the executive. Cabinet ministers who disagree with major decisions are expected to resign, Robin Cook being a recent example over the decision to go to war with Iraq in 2003. The principle of collective responsibility is not impaired by the fact that decisions may be made in a cabinet committee rather than by the full cabinet. Individual ministerial responsibility is the convention that in their capacity as head of department, a minister is personally responsible for the actions and failings of their department. Under circumstances of gross failure in their department, a minister is expected to resign (and may be forced to do so by the Prime Minister), while their civil servants remain permanent and anonymous. This is relatively rare in practice, perhaps because administrative failure is of less interest to the media than personal scandal, and less susceptible to unequivocal proof. The closest example in recent years is perhaps Estelle Morris, who resigned as Secretary of State for Education and Skills in 2002 following severe problems and inaccuracies in the marking of A-level exams. The circumstances under which this convention is followed are not possible to define strictly, and depend on many other factors. If a minister's reputation is seen to be tarnished by a personal scandal (for example when it was luridly revealed that David Mellor had an extramarital affair) they very often resign. This often follows a short period of intense media and opposition pressure for them to do so. In general, despite numerous scandals, in Britain known cases of serious corruption (e.g. acceptance of bribes) are relatively rare in comparison with many other democracies. Parliamentary Questions can be tabled for ministers in either house of Parliament for either written or oral reply. These may be "planted" questions for the advantage of the Government, or antagonistic questions from the Opposition, or may genuinely seek information. Cabinet ministers must respond, either themselves or through a deputy, although the answers do not always fully answer the question. Written answers, which are usually more specific and detailed than oral questions are usually written by a civil servant. Answers to written and oral questions are published in Hansard. 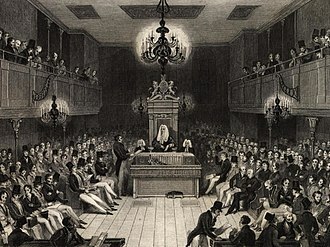 Parliament cannot dismiss individual ministers (though members or a House may call for their resignation, or formally resolve to reduce their salary by a nominal amount), but the House of Commons is able to determine the fate of the entire Government. If a vote of no confidence in the Government passes, then the Queen will seek to restore confidence either by a dissolution of Parliament and the election of a new one, or by the acceptance of the resignation of her entire government. the "payroll vote" (a term which refers to the fact that all members of the government must vote with the government, or else resign or be fired). The combined effect of the Prime Minister's ability to control Cabinet by circumventing effective discussion in Cabinet and the executive's ability to dominate parliamentary proceedings places the British Prime Minister in a position of great power, that has been likened to an elective dictatorship (a phrase coined by Quinton Hogg, Lord Hailsham in 1976). The relative inability of Parliament to hold the Government of the day to account is often cited by the UK media as a justification for the vigour with which they question and challenge the Government. This is often controversial as some people believe that Individual Media Corporations have had key influence upon certain components of British elections. The classic view of Cabinet Government was laid out by Walter Bagehot in The English Constitution (1867) in which he described the prime minister as the primus‐inter‐pares ("first among equals"). The view was questioned by Richard Crossman in The Myths of Cabinet Government (1972) and by Tony Benn. They were both members of the Labour governments of the 1960s and thought that the position of the Prime Minister had acquired more power so that Prime Ministerial Government was a more apt description. Crossman stated that the increase the power of the prime minister resulted from power of centralised political parties, the development of a unified civil service, and the growth of the Prime Minister's private office and Cabinet secretariat. Graham Allen (a Government Whip during Tony Blair's first government) makes the case in The Last Prime Minister: Being Honest About the UK Presidency (2003) that in fact the office of prime minister has presidential powers, as did Michael Foley in The British Presidency (2000). However the power that a prime minister has over his or her cabinet colleagues is directly proportional to the amount of support that they have with their political parties and this is often related to whether the party considers them to be an electoral asset or liability. Also when a party is divided into factions a Prime Minister may be forced to include other powerful party members in the Cabinet for party political cohesion. The Prime Minister's personal power is also curtailed if their party is in a power-sharing arrangement, or a formal coalition with another party (as happened in the coalition government of 2010 to 2015). The Official Opposition (the non-government party with the largest number of elected Members of Parliament—in practice either the Labour or the Conservative Party) is led by the Shadow Cabinet, supported by numerous junior Opposition frontbenchers. 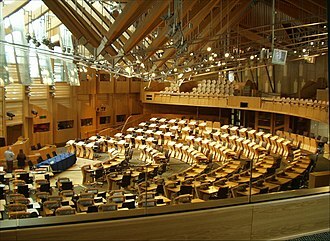 The Scottish National Party, as of 2015[update] the third-largest party, has a set of spokesmen in the House of Commons, known by their leader's name as the Frontbench Team of Ian Blackford. ^ "The Cabinet". Number10.gov.uk. Retrieved 28 January 2015. ^ "How do you address a Lord?". www.parliament.uk. UK Parliament. 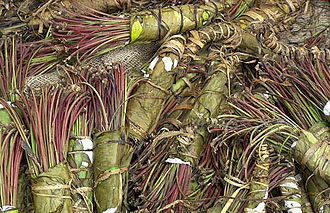 Retrieved 15 May 2015. Rt Hon. should be used when a Lord is a member of the Privy Council. ^ Cabinet Office Precedent Book Archived 4 March 2016 at the Wayback Machine, 1992, page 79. ^ Jones, George (2 July 2007). "Cabinet moves to Tuesdays". The Daily Telegraph. ^ "David Cameron coalition team in first cabinet meeting". news.bbc.co.uk. BBC News. Retrieved 15 June 2017. ^ "PRIME MINISTER. Cabinet meeting held at Grand Hotel, Brighton, 4 October 1966: request..." discovery.nationalarchives.gov.uk. The National Archives. ^ "Regional cabinet meetings". parliament.uk. UK Parliament Research Briefings. Retrieved 9 January 2019. ^ "Newspaper support in general elections". The Guardian. ^ a b c Fairclough, Paul (2002). "6.1 The Primemister". Advanced Government and Politics. Oxford University Press. ISBN 978-0-19-913434-2. ^ a b Williams, Andy (1998). "Prime ministerial government". UK Government & Politics. Heinemann. pp. 113–114. ISBN 978-0-435-33158-0. ^ Foley, Michael (2000). "Chapter 1: The Blair revolution and presidential standard". The British Presidency. Manchester University Press. pp. 1-26. ISBN 978-0-7190-5016-9. ^ "Ministerial appointments: January 2018". gov.uk (Press release). British Government. 9 January 2018. Archived from the original on 13 January 2018. Retrieved 13 January 2018. ^ "Her Majesty's Government". parliament.uk. Parliament of the United Kingdom. Archived from the original on 13 July 2018. Retrieved 13 July 2018. 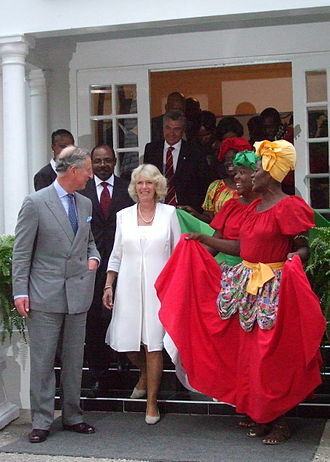 Wikimedia Commons has media related to Members of the Cabinet of the United Kingdom. Prerogative powers were formerly exercised by the monarch acting on his or her own initiative. Today the royal prerogative is available in the conduct of the government of the United Kingdom, including foreign affairs, defence, a prominent constitutional theorist, A. V. Case law exists to support both views. A clear distinction has not been necessary in the relevant cases, the royal prerogative originated as the personal power of the monarch. 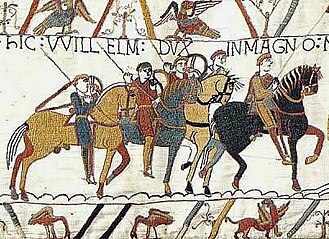 From the 13th century in England, as in France, the monarch was all-powerful, an early attempt to define the royal prerogative was stated by Richard IIs judges in 1387. During the 16th century, this began to recede. 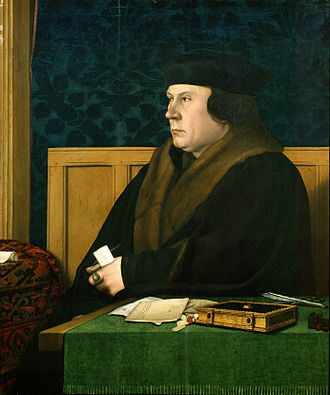 Under Henry VIII and his successors, the king was the head of the Protestant English church, the rise of Parliament in this period, was problematic. 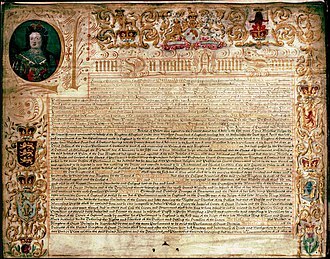 While the monarch was the predominant partner in the English constitution, in Ferrers Case, Henry recognised this, noting that he was far more powerful with the consent of Parliament than without. Nowhere was this more apparent than in the matter of taxation, Sir Thomas Smith, at the same time and his descendants normally followed the will of the courts, despite the fact they were theoretically not bound by judges. William Holdsworth infers that by asking the legal officers of the crown and judiciary for legal advice and consent. He contends that the view that the law is supreme over all was the view of all the lawyers and statesmen. It was accepted that while the King had unfettered discretion, he was limited in areas where the courts had imposed conditions on the use of the prerogative, the first dent in this stability came about in 1607, with the Case of Prohibitions. James VI and I claimed that as monarch, he had a right to sit as a judge. 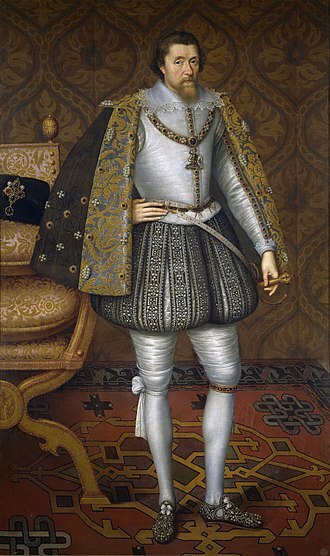 Led by Sir Edward Coke, the judiciary rejected this idea, stating that while the monarch was not subject to any individual, he was subject to the law. Until he had gained sufficient knowledge of the law, he had no right to interpret it, which requires long study and experience, before that a man can attain to the cognizance of it. Theresa Mary May is the Prime Minister of the United Kingdom and Leader of the Conservative Party, having served as both since July 2016. She has been the Member of Parliament for Maidenhead since 1997, may identifies as a one-nation conservative and has been characterised as a liberal conservative. She is the second female Prime Minister and Conservative Party leader after Margaret Thatcher, the daughter of a vicar, May grew up in Oxfordshire. From 1977 until 1983, she worked for the Bank of England, after unsuccessful attempts to be elected to the House of Commons in 1992 and 1994, she was elected as the MP for Maidenhead in the 1997 general election. She was Chairman of the Conservative Party from 2002 to 2003, after the formation of a coalition government following the 2010 general election, May was appointed Home Secretary and Minister for Women and Equalities, giving up the latter role in 2012. Reappointed after the Conservative victory in the 2015 general election, she went on to become the longest-serving Home Secretary since James Chuter Ede over 60 years previously. She won the first and second ballot of Conservative MPs by a significant margin and was due to face a vote of Conservative Party members in a contest with Andrea Leadsom, leadsoms withdrawal from the election on 11 July led to Mays appointment as party leader the same day. She was appointed Prime Minister on 13 July, as Prime Minister, Mays focus has primarily been on withdrawing the UK from the European Union. Born on 1 October 1956 in Eastbourne, May is the child of Zaidee Mary. Her father was a Church of England clergyman who was chaplain of an Eastbourne hospital and he became vicar of Enstone with Heythrop and finally of St Marys at Wheatley, to the east of Oxford. Mays mother was a supporter of the Conservative Party. May was educated primarily in the sector but with a short spell at an independent Catholic school. She initially attended Heythrop Primary School, a school in Heythrop, followed by St. Julianas Convent School for Girls, a Roman Catholic independent school in Begbroke. At the age of 13, May won a place at the former Holton Park Girls Grammar School, during her time as a pupil, the Oxfordshire education system was reorganised and the school became the new Wheatley Park Comprehensive School. The 1st Battalion, Irish Guards accompanied by the Band of the Irish Guards provide a Guard of Honour at the House of Lords for the State Opening of Parliament in 2016. The Palace of Westminster is home of the two houses of the British Parliament. It is here where the monarch travels to open parliament. The State Coach carrying the Imperial State Crown, which is visible through the central window. The coach carrying the maces, which are to be carried by the Sergeants-at-Arms in procession. Entrance to the Parliament House, the home of the Supreme Courts of Scotland, in Parliament Square, Edinburgh. The Order Paper for Wednesday, 24 June 2009.